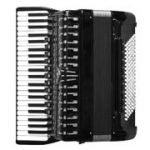 If you're looking for accordionists on YouTube then check this category. You'll find here YouTube channels with accordion related videos and accordion players from all over the world. YouTube Channel with accordion & guitar gaúcho covers of popular songs. Germano Fogaça & Lawrence Wendt. Accordion YouTube channel called "Fisarmoniche by Marco" with many accordion videos. CHLUMIREK's YouTube Channel. Videos with Czech accordionist Miroslav Jiravský "CHLUMIREK". You'll find here The Beatles accordion covers and much more. Lee Terry Meisinger's YouTube Channel. Videos with live accordion music: Under Paris Skies, Lady of Spain, Italian Medley, España Cañí, Tico Tico, Dark Eyes, Tea For Two, After Your Gone, Jalousie, Malagueña and many more. If you like pop / rock music and accordion covers then you must check this YouTube Channel created by Jense Meek (Accordionistic). Really creative singing accordionist.